Tent or Tharpu Peak Climbing commonly known as a Tharpu Chuli peak is situated in the heart of Annapurna Base Camp at an elevation of 5663m. Tent Peak offers brilliant picturesque views of the incredible mountains lying along the Annapurna Region with some other majestic peaks like Hiunchuli and singuchuli. The trek passes through excellent stream valley of Modi Khola, passes through fascinating Gurung society, delightful terrace farms and high waterfalls. The surrounding mountains and additionally the scenery from the top of the peak is simply superb. 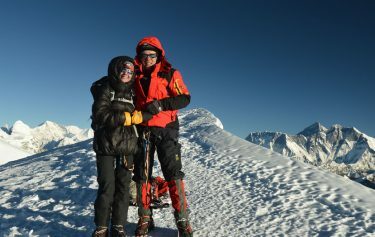 The great thing about tent peak climbing is, it could be consolidated with Annapurna Base Camp trek. 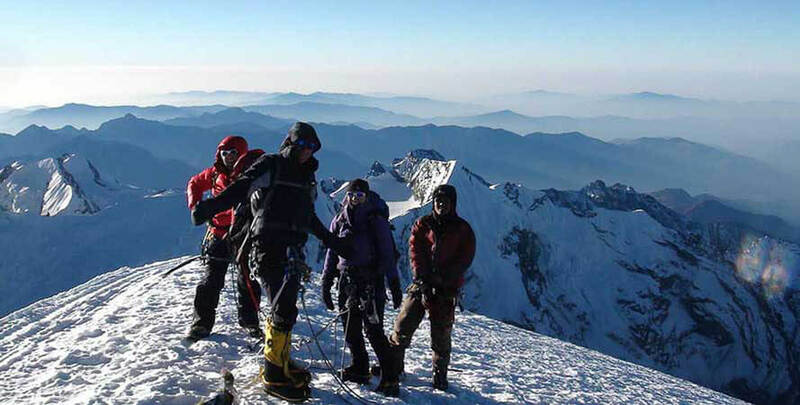 Tent peak expedition is one of the challenging climb as it involves face climbing and tiptoeing on knife edge ridges. 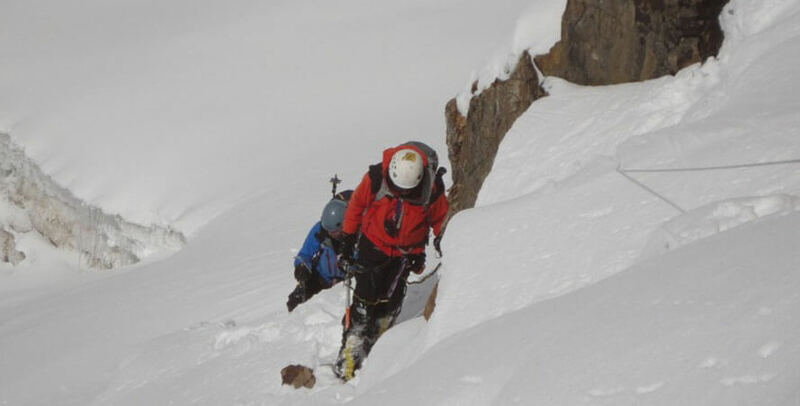 We are the team of the professional and well experienced guides. We are committed to offer a full satisfaction and memorable trip of lifetime for our valuable customer with full safety. The trek passes through excellent stream valley of Modi Khola, passes through fascinating Gurung society, delightful terrace farms and high waterfalls. 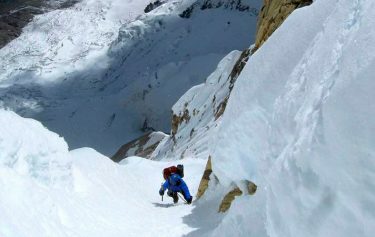 The Tent Peak offers attractive peaks like Hiunchuli and singuchuli as well as the scenery from the summit is simply superb. Day 6: MBC to ABC [4,130m/13,545ft]. Day 7: Acclimatization & Climbing Preparation . 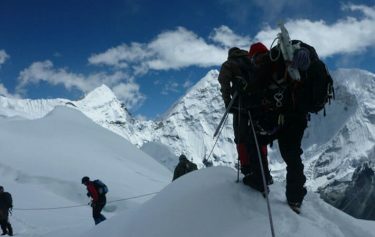 Day 11: Descent to Tent Peak Base Camp then to ABC. We drive or fly to Pokhara which is also known as city with lakes as it hosts numerous beautiful lakes like Fewa lake, Begnas Lake, Rara lake etc. The place like Sarangkot in Pokhara offers magnificent views of Dhaulagiri, Manaslu, Machhapuchhare, five peaks of Annapurna and others. 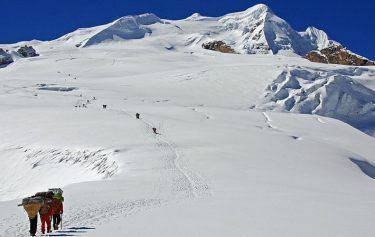 We climb up for an hour up to Ghandrukkot and then a steep descent takes us to the Kimron Khola. After another steep ascent from Kimron Khola. Then we take a steep climb continuing up to Chhomrong. Towering above the village is the mighty peak of Annapurna South, with the Fishtail Mountain (Machhapuchhare) facing it across the valley. The trail passes through solitary places. Climb again to the Hinko Cave, an overhanging rock. Climbing further arrive at Deorali and after about half an hour walk from Deorali, we will find ourselves in middle of river bed surrounded by giant snow-covered mountains. The hike to MBC is somewhat strenuous but the unfolding views of the majestic Machhapuchre are certainly a rewarding experience. Enjoy the views of Mount Hiunchuli, Annapurna South, Annapurna I, Annapurna III, Gangapurna and, of course, the Fishtail or Machhapuchhare itself. On the way to ABC from MBC, the vegetation disappears. , follows a stream, and then climbs to a few huts alongside a moraine. Annapurna Base Camp sanctuary boasts of a dynamic view without anything impeding panorama of the 360 degrees. 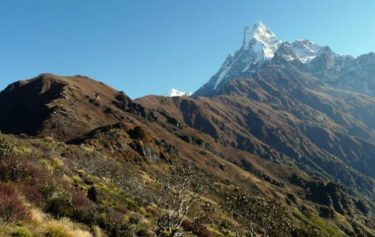 views of the Machhapuchre, Annapurna south, Annapurna I, Hiuchuli and other peaks. Climax of our trip almost ends today. Rest and climbing tranning, check the equpment, train about the rope, breef by our climbing guide.Feel free to ask any question with your team leader and guides that you may have regarding the climb. We cross the glaciated mountain passes descending onto Annapurna South Galcier. Follow the cairned trail across the surface on the ice. Climb the moraine on the opposite bank of the glacier. Enjoy the views of the high mountains from 6000ers to 8000ers. Finally arrive at the Tent Peak Base Camp which is a flat camping area. Make a steep ascent to the Tent Peak High Camp. 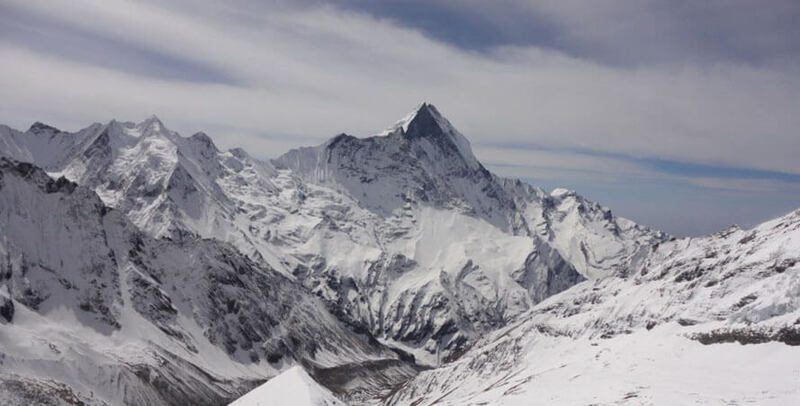 Enjoy the panoramic views of Hiunchuli (6441m), Annapurna South (7229m), Annapurna I (8091m), Fishtail Mountain, and other snow-capped high mountains. Climb the hill to a glacial bowl. Around midnight, we get ready for the final push. 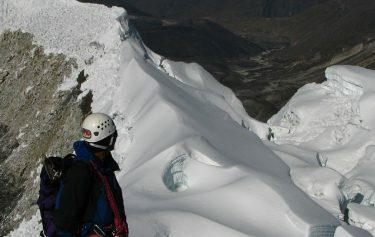 Cross the short glacier to reach the base of several snow flutings. 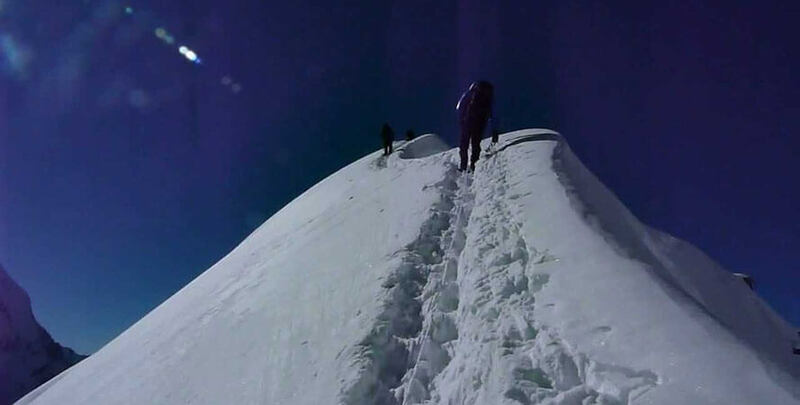 Climb fixed ropes to the final summit ridge. As we get nearer the summit, a sharp top of Tent Peak (5663m / 18,580 ft) unfolds. 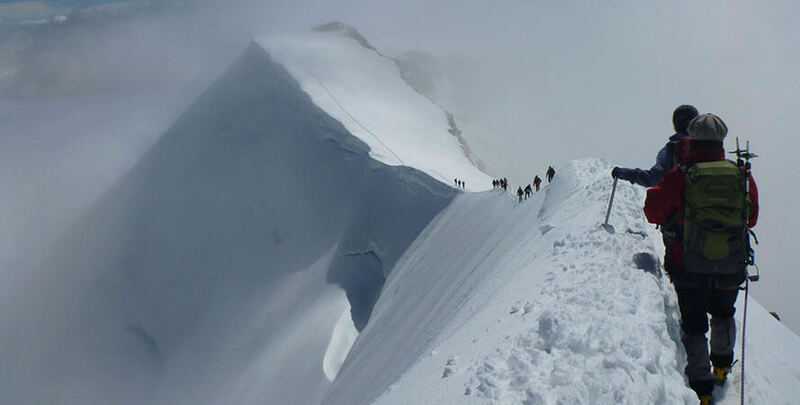 After summiting, we return by the same route to the high camp. 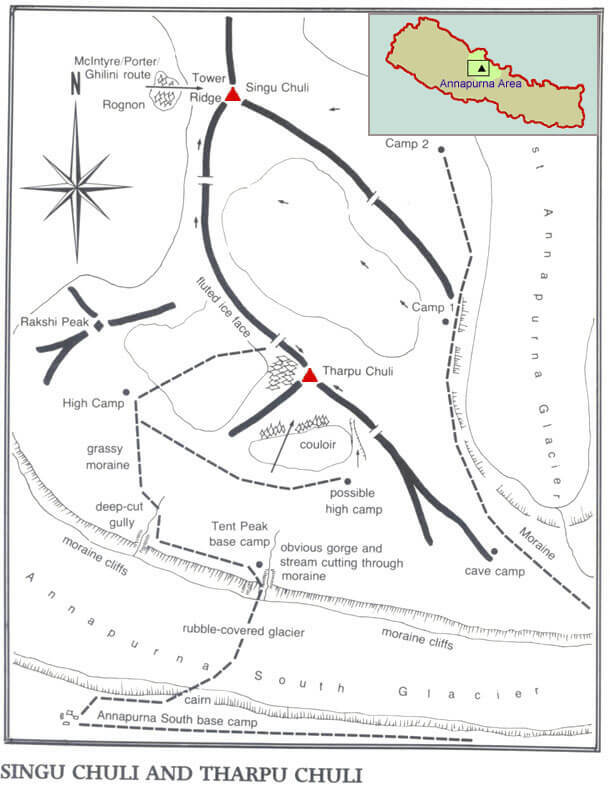 We descend to the glacier and to Tent Peak Base Camp. 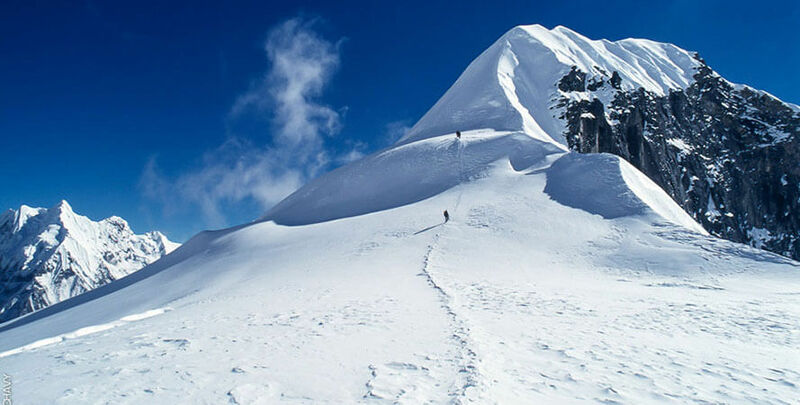 Trek further down to the Annapurna Base Camp. Reaching the ABC. Get up in the early morning and savor the magnificent sunrise over the Himalayas from ABC. Afer taking breakfast, we start descending from ABC to MBC, Deurali, Doban and finally to Bamboo. From Bamboo we make a steep ascent to the Kuldi Ghar and then to Sinuwa. Follow the stone steps that leads to Lower Chomrong. Then ascend on the thousand stony steps taking us to Upper Chomrong. From Chomrong we descend to Jhinu Danda. Trek from Jhinu danda to New bridge and then to Kyumi village. After lunch we trek to Syauli bazar and then down to Birethanti. From Birethanti, about an hour's trek and we arrive at Naya Pul. The trek ends at Naya Pul. From Naya Pul we take a vehicle and reach Pokhara in about an hour.